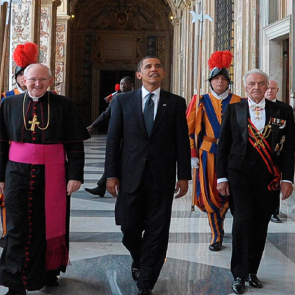 President Obama will meet Pope Francis on 27 March in the Vatican as part of a European tour. Fr Federico Lombardi SJ, director of the Holy See Press Office, also confirmed the meeting. US Secretary of State John Kerry travelled to the Vatican last Tuesday for a meeting with his Holy See counterpart, Cardinal-designate Pietro Parolin, during which the agenda for the March meeting was agreed. “I know that the Holy Father is anticipating the visit of President Obama here, and the President is looking forward to coming here to meet with him. So much was agreed on as a mutual agenda this morning, and I’m particularly pleased to know that the Holy Father and the Secretary of State in the Holy See will continue to speak out about peace in the Middle East, continue to try to bring the parties together, continue to help address some of the most pressing concerns that are challenging failed states and failing states in too many parts of the world. “It is good to know that we will have this common enterprise together,” he added. When Mr Obama met Pope Benedict XVI in 2009 their conversation touched on shared concerns for global poverty and Middle East peace but Benedict XVI also drew attention to the Church's opposition to abortion and embryonic stem-cell research, both of which Mr Obama backs, and even handed Mr Obama a Vatican booklet on bioethics explaining the Church's position on both issues.